Dr Immo Fiebrig interviewed Maddy Harland about how Permaculture Design can enhance the design of Agroecology systems. What are its differences and what are its similarities? What elements of design in permaculture can be linked to agroecological practices and to what extent are they functional in terms of sustainable or regenerative farm productivity and in what context? Agroecology works well with permaculture design: it uses stacking to create multi-functional yields, microclimates, greater edges, biodiversity, integration of crops rather than monocultural systems, utilizes niches, designing from patterns to details, minimizing waste, using renewable resources, and it is creative and open to experiment and adaptation and– for instance, Moringa is being trailed in Africa, Central and South America as a nitrogen fixer that yields a highly nutritious crop. It is regenerative as well as sustainable because it can grow its own fertility (no petro-chemicals), stabilize soil, lock carbon in the soil to sequester it from the atmosphere - it is a vital climate cooling form of agriculture. Preventing soil erosion also enhances water quality, ensuring better breeding habitats for aquatic creatures. It is part of a relocalised food production saving food miles and establishing greater food security. It also models itself on indigenous, local forms of agriculture, a shift away from a western neoliberal form of commercial that seeks to export techniques and create a requirement for hybridized seed and mechanized equipment. Permaculture is not restricted to Earth care systems, it also has the potential to engage its other ethics: people care and fair shares/limits to growth. Agroecology is a growing system whilst permaculture design is a holistic systems based design system that can be applied to land based systems and beyond. It is interesting to note that Agroecology and the right to food (2012) presented to the United Nations Human Rights Council is a report based on an extensive review of recent scientific literature. The report demonstrates that agroecology, if sufficiently supported, can double food production in entire regions within 10 years while mitigating climate change and alleviating rural poverty. What elements fulfill both an aesthetic and a productive function - what elements are mostly aesthetic? In a well designed system, all elements can be aesthetic and functional. For example, tropical flowering native trees attract pollinators. Similarly, wildflower meadows in orchard or forest garden system provide habitat, attract pollinators, and pest-predator like bats who predate on codling moths. There is no either/or. In what respect would 'the whole' be more than 'its elements'? In respect to pest control, restabilising soils, creating habitat, fixing nitrogen. The whole provide ecosystem services if we must use that terms. With regards to the previous questions, what farms would you propose as of 'lighthouse character'. My trip to Belize in March 2017 took me to Sattva Land, a three year old food forest designed with permaculture, a former citrus farm and then its ‘parent’, Maya Mountain Research Farm, which was a citrus and cattle farm 27 years ago. They both demonstrate how permaculture can regenerate landscapes using techniques like building swales, making and ultilising biochar to enhance fertility, intercropping, and designing microclimates and exploiting niches and edges, to allow a great variety of species to thrive, i.e. biodiversity. They also demonstrate ecological building techniques, the use of renewable energy, education, people care, respect for indigenous knowledge and traditions, food security. MMRF specifically offers a scholarship programme to disseminate this knowledge both regionally and all over C and S America. It is an impressive lighthouse project. I am also impressed by the progress of the Rainforest Saver Project, a charity promoting as a replacement for slash and burn farming in tropical rainforest areas. They work with projects in Honduras and Cameroon and soon Ecuador. Slash and burn is an unsustainable agricultural technique practiced by 200 to 300 million tropical farmers worldwide, because that is the only way of making a living that they know. It means continuously cutting down the rainforests. Inga alley cropping is a successful alternative. Rainforest Saver supports local, grassroots organisations to promote this better way of farming in practical ways. In Britain, food forest experimentation currently more on garden than farm scale systems. Well established examples are Graham and Nancy Bell in The Scottish Borders, Tim and my garden in Hampshire, Martin Crawford in Devon. These three are 25 years old or more. There are also a whole host of developing forest gardens and this is becoming a movement! 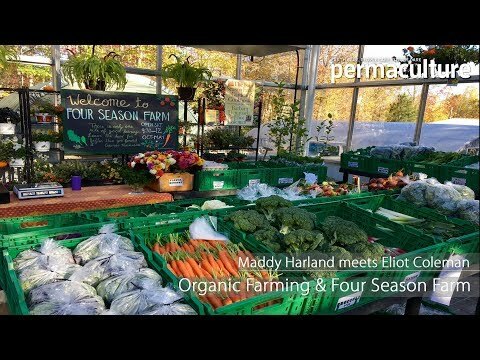 Maddy Harland is the editor and co-founder of Permaculture magazine. You can pay a visit to her forest garden via YouTube. is the author of Fertile Edges - regenerating land, culture and hope. “Breathtaking and strangely rollicking good fun.” John D Liu, Green Gold film maker. Read more about Sattva Land and Maya Mountain Research Farm in the new Permaculture magazine issue 94 where Maddy has written a more detailed account of her visits to both sites. Dr Immo Fiebrig is a post-doctoral research fellow at Coventry University. His current research focuses on Sustainability Assessment, Monitoring & Evaluation of productive permaculture systems, thus leading to the introduction of permaculture produce to the food value chain. This interview was conducted for the first Agroecology Europe Forum - 25-27 October 2017.